Latest news on the reunion! See following letter. Ive been expecting a call from you, but you have been quiet of late. 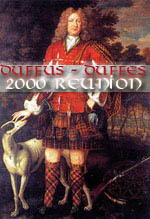 Re Duffus 2000, George and I had a meeting to discuss plans for a Ceilidh (real highland party) for the Saturday night. We discussed hotels or halls, party items , a band or not, and a programme. We decided that the local hotels would not accommodate 100 or more guests. So we opted for George to revisit the area and look around. A Ceilidh is better suited for a church or village hall. He was lucky, appropriately Duffus Village Hall has been refurbished and can hold up to 200, and was available  George booked it for Saturday night, provisionally, subject to your approval. He has friends in the whiskey business who can probably supply Tartan etc. as decorations. The local inn does "buffet" purveys and Georges friends in the area says he is very good. He can be provisionally booked if you approve (numbers later 0> Additionally, the local Duffus Inn has been approached and will even come over to the hall and supply and run a small bar, if you approve. If we can use this facility, we can do the whole thing for well under 20 pounds a head, as people buy only what they want to drink. This includes the rent of the hall and food and entertainers. George is quite happy to be M.C. (Master of Ceremonies) and will organise a small band, singers and entertainers, mostly Duffuss. George is willing to put this through his computer to you, but Im writing in case the computer plays up. Obviously at some point we will have to get firm promises of the numbers likely to attend the Ceilidh: anyway its now all coming together and all my family are to be there. Thats Harry, Alan, George, Innes, Isobel, with families (except Isobel). Let us hear from you about the suggestions so far. The information received about John Duffus of Banff and his progeny, I have put together in the form of a chart and thought you might like to have a copy, together: with some background information about the Drucki-Lubecki and Broel-Plater connections. Also, as requested, I am sending copies of the photographs of Rev. John Duffus and his wife sent to me by Ruth Duffus - they were not very good photocopies and I could not improve on them very much. I have been doing some more research on behalf of the Duffuses generally.Attached, please find details of all the family listed in the Dundee Street Directory up until the time the Directory was discontinued. This is not necessarily comprehensive, because the agents who visited each household would only make one or perhaps two visits. If no one was at home, then they did not appear in the directory. Also you could of course ask that your details be not published. However, it may be of help to some of the family. The second attachment is from the Voter's Roll. This again will include only those franchised to have the vote. For example it was The Married Woman's Property Act of 1884, which allowed (only) female property owners to have the vote for the first time. Similarly not all men were franchised to vote. However the details may help someone to trace a connection. Finally, the list ends in the early 1900's. This is because up until that time the names were in alphabetical order, by 'wards' of the town. After that the lists were printed by street names. This would mean looking at every name in every street. When you consider that at one time the City had a population of 76,000, that would be quite an operation. However if anyone would want details of a particular relative whose address is known for a particular year, then I will be happy to check the records. Thanks for all your work on your terrific website! Just want to let you know we have changed servers from westnews@pinc.com, and our new e-mail address is westnews@home.com If you are knocking around Tibet I can assume you are in very good health (at least when you started). Our son Robert John Duffus new e-mail is nerg@home.com and younger son James Malcolm Stuart Duffus is jamesduf@microsoft.com Dare I add "Season's Greetings"? Just a short note to say my family will attend the re-union.We met in Aberdeen last year . I am Gordon, son of Gordon Duffus. My brothers will attend as will my sister. I will write to you soon with definite numbers. Thanks for putting our photos in our family tree under Allenvale of Aberdeen.We will sort out our own hotel. I will personally look forward to this as my birthday falls on the 29th and I will be the big 40. Speak soon. (sorry about the spelling). Could you please help me find out the background of my family. > Firstly, apologies for the delay in replying to your request. I have a few contacts which should help with your gathering next July. > The only local organisation that could accommodate a large residential group in the Duffus area is Gordonstoun School and this may be available for your group during the summer holidays. Please contact Mr. Pyper, Headteacher, Gordonstoun School, Duffus, IV30. The telephone number is: 01343 837837. > The Moray Council also has a Residential Centre at Cullen which has approximately 30 beds, but is some distance away from Duffus. If you are interested, please contact Lucy Jones, Cullen Community Education & Residential Centre, Seafield Street, CULLEN. Telephone - 01542 840701. > A contact for the local village hall is Mrs. S McKnockitor, 19 Hopeman Road, Duffus. The hall committee might be interested in hosting a social event for your group. > Please contact Robin Weeden, Community Development Worker, Lossiemouth Community Education Centre, Coulardbank Road, Lossiemouth, IV31 6JW. Telephone 01343 815299 for other information and help in the Duffus/Lossiemouth area. > I hope the above is of some help to you and that your gathering next summer is a great success. After several months of not having an address and only now catching up on the news, I thought I had better let everyone know. So please amend your records from BISUME@aol.com to the above address and if you have been trying to send me anything and had it sent back I would be grateful if you will resend. I am glad all is going well for the celebrations in the summer (it seems a long time away with the cold and the rain!!!) and we will be booking our hotels shortly. I believe out party maybe about 7 or 8 altogether as my sister is planning to come along with her family. Anyhow it is nice to be back on line and I look forward to fully catching up with all the news. My name is Marika and I represent International Strategies Ezyfind.com, an online business and community directory. We have chosen Duffus Castle to be included on our site as a major attraction in the city of Elgin. To ensure our site is as exciting and entertaining as your attraction we require a picture to accompany the information about the castle. Thus, I am writing to ask you permission to use the Duffus Castle photo located at http://www.duffus.com/duffuscastle.htm on your Web site. Please feel free to pursue our site at www.ezyfind.com, I am sure you will be impressed with the thought and effort we put in to creating interesting facts and content about our chosen cities and attractions. I am writing in reply to your letter which I recently received from yourself inviting all Duffuses to a reunion in July 2000. Could you please send me any information you have as I wish to attend this reunion. If possible could you send any information on the Duffus History as I have little knowledge of my surname as my grandparents passed away when I was young. I was told that some of my family had moved abroad but had no forwarding addresses. P.S. Could you please pass on any addresses which I could contact for more information. Many thanks once more for your letter and information. I am happy to say that I have obtained a 4 star B & B in Duffus or as they now say  Dufftown  which I dislike & cant understand why they changed it! I was sent two very informative magazines by a friend in Crieff so I will pass the best one on to you as you may wish to make it available to the people that have need for accommodation. I cant believe there are so many of us in the world. The walk to the Castle should be quite a human spectacle. With grateful thanks for all your effort on our behalf. P.S. The Bears are at the B.C. Childrens Hospital and in memorial to honour our daughters memory. Sorry that it has taken so long to write and thank you for your correspondence regarding the "Gathering." Things are beginning to come together now with the Calendar of Events being published. It should make for an enjoyable weekend. The one thing that you cannot organize is the weather, so I hope it is good for that period. I had a thought, that all big events and gatherings a ??? time specially written to communicate them. It would be nice if one could be written for the Duffus Reunion. Names that I would suggest would be "Duffus Castle 2000," "Clan Duffus ???? etc., "Duffus Gathering/Reunion 2000" or perhaps someone can think of a more reliable title. In order to get your database completely accurate, I would like to point out one or two slight changes in the details about my family. My post code should read "IG8 9DD" not "148" (probably due to my bad handwriting). The last line should read: "Wife of John William Duffus  Paula (not Pamela) and their two children" (again probably my bad writing). I hope you didnt mind me pointing out these slight errors, but it will then give an accurate record. I think that I also mentioned that my wife Eileen Lillian Duffus will be attending the Reunion. Many thanks for your kind invitation to the above Reunion which I will have much pleasure in accepting. We decided that the local hotels would not accommodate 1000 or more guests. So we opted for George to revisit the area and look around. A Ceilidh is better suited for a church or village hall. He was lucky, appropriately Duffus Village Hall has been refurbished and can hold up to 200, and was available  George booked it for Saturday night, provisionally, subject to your approval. He has friends in the whiskey business who can probably supply Tartan etc. as decorations. The local inn does "buffet" purveys and Georges friends in the area says he is very good. He can be provisionally booked if you approve (numbers later 0> Additionally, the local Duffus Inn has been approached and will even come over to the hall and supply and run a small bar, if you approve. If we can use this facility, we can do the whole thing for well under 20 pounds a head, as people buy only what they want to drink. This includes the rent of the hall and food and entertainers. George is quite happy to be M.C. (Master of Ceremonies) and will organise a small band, singers and entertainers, mostly Duffuss. © 1999 David Duffus. All rights reserved.